Want to keep your staff motivated about learning new concepts? The quality and variety of the employee training you provide are key for motivation. 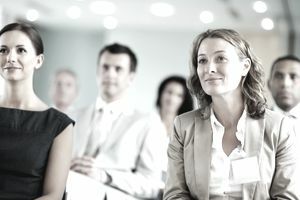 Reasons to offer employee training are many, from new-hire operational training to introducing a new concept to a workgroup to installing a new computer system. Whatever your reason for conducting an employee training session, it's critical to develop the employee training within the framework of a comprehensive, ongoing and consistent program. This quality employee training program is essential to keep your staff motivated about learning new concepts and ultimately keep your department profitable. A complete employee training program includes a formal new hire training program with an overview of the job expectations and performance skills needed to perform job functions. A new hire training program provides a fundamental understanding of the position and how the position fits within the organizational structure. The more background knowledge the new associate has the ways in which one workgroup interrelates with ancillary departments, the more the new associate will understand his or her impact on the organization. Another aspect of a comprehensive employee training program is continuing education. The most effective employee training programs assign the responsibility of continuing education to one person in the department. This is an important function in order to keep all staff members current about policies, procedures, and the technology. A solid new hire training program begins with the creation of an employee training manual. This manual acts as a building block of practical and technical skills needed to prepare the new individual for his or her position. In order for the department to understand current policies and procedures, a manager must ensure the department manuals or online employee training are kept current. This includes any system enhancements or changes in policy or procedure. In addition, focus on the user when designing training manuals or online training. Use language that isn't corporate, include images and multimedia and keep it interesting for the reader. When possible, incorporate visual images of the computer screen with screen captures to illustrate functions, examples, and how-tos. Another form of new hire training includes training a new associate directly next to an existing associate. Some call this On the Job Training (OJT) or side-by-side training. This strategy allows the new associate to see first hand the different facets of the position. Also, OJT allows the new hire the opportunity to develop a working relationship with an existing associate. Here are additional resources for new employee training and orientation. A continuing education program for a department is just as important as the new hire training. When training a new associate, understand that they will only retain approximately 40 percent of the information learned during the initial training session. Therefore, reminding the staff about various procedures and concepts needs to be ongoing, with either a formal or informal approach. The formal or traditional approach to employee training often includes a member of management sending a memo to each associate. The informal and often more appealing approach to a visual learner is to send a one-page information sheet. This information sheet, called a training alert, should be informative and presented in a non-threatening manner. If a policy or procedure changes, the informal approach would better prepare the department to receive this update. Prior to putting together a continuing education employee training program, the management team must decide upon their desired outcome. One important question to consider: "Do you want the program to enhance the skills of your associate or do you want to help your associate with personal development?" While there is some commonality between these answers, the main difference is the opportunity for the management team to mold future management team members. If the desired outcome is simply to enhance skills with no personal development, the department will have a staff that simply knows how to do their job a little better. While that is a positive outcome, you want your company to think "outside the box," and design a program that allows and even encourages critical thinking and problem-solving. Thus, when designing a continuing education program, the desired outcome should blend both technical and personal enhancement. This type of training program allows the staff the opportunity to develop solid management skills coupled with a better understanding of their position and function and understand how they fit into the organization. If you discover during the assessment process, for example, that writing skills in the department are low, you'll need to enhance those skills by developing a corresponding training session. This writing session could include topics on the basics of writing such as spelling, punctuation, sentence structure and correct word use. Building on those basics, you could give your participants an applicable exercise, such as writing a letter to a customer apologizing for a late shipment. Provide the participant's background information about the customer. Tell them the customer has purchased for ten years and has always made payments promptly. Give them ten or fifteen minutes to compose a rough draft and then present their letter to the group. Once someone has read a letter, ask participants to offer feedback for improvements; as the trainer, point out the positive aspects of the letter. Another mechanism that will help with ongoing continuing education is enabling staff members to develop an affiliation with an association or industry group. This kind of education is tangible and has been proven to have a positive track record with the local offices and their industry trade groups. Staff members are given the opportunity to come together periodically and discuss the issues they are experiencing in their business. The best type of employee training program for a workgroup is one tailored to their needs. So how do you know what their needs are? One way is to work with the staff members who are responsible for the area. If possible, do a random sampling of the staff performance development plans and look for consistencies in any needed areas of development. Another approach is to conduct a training needs assessment and ask the staff members themselves what skills they would like to develop. No matter how you determine what types of employee training sessions are needed, remember that when developing the course, stick to the original concept. If more than one concept is considered during the planning process, break the concepts out into two workshops. Keep in mind that a productive employee training session can and should be accomplished in less than two hours. Anything longer than two hours and you will lose your audience. Finally, during the actual training session, have at least one or two activities to keep the participants' minds active and to prevent nodding off or daydreaming. Do You Really Need an Employee Training Session? While an employee training session may be effective, it may not always be the best approach to fulfilling training needs. If the concept you are introducing is defined as elementary or common knowledge, create an employee training alert instead. Use colored paper and add some flare and/or graphics to the piece of document. I have found that when staff members receive a piece of fluorescent green paper in their mailbox rather than a white one, they are more likely to pick it up and read it. If the capabilities are available and the department wants to have some fun while learning, develop a game. This can be anything from Family Feud to Jeopardy and more. Have the staff answer questions created by the department management relating to work situations and/or people. It is amazing what people will remember from a fun situation versus a forced learning experience. Keep employee training classes informative and light. While communicating the ideas is important, the number one goal should be to keep the staff interested, involved and entertained during the workshop. This can be difficult if you do not employ an animated trainer. Introduce the department to the concept of blended learning. Allow the staff to achieve their learning levels from different resources. While the employee training alerts and employee training sessions come directly from management, challenge the staff to look online for other ideas that might work in their department. First and foremost, remember is that learning can and should be fun. Your staff members want to absorb knowledge, and they'll most likely want to learn concepts when they are presented in a fresh, lively and exciting manner. Putting a twist on your current employee training methods can help people become excited about learning. Jeffrey Bodimer is the Chief Operations Officer / Chief Compliance Officer at American Higher Education Development Corporation.